In Yiwu lock market, the major products are the lock padlocks, chain lock, ball lock, password lock, cylinder locks, key blanks, all kinds of handles and so on. And now after self-adjustment in the market, we can also find the emergence of a number of related products, such as mobile phones, etc. The lock industry shop in Yiwu Futian market mainly concentrated in International Trade City Ⅱ, stage F area. The product categories are very abundant. At present, the demands of lock products in domestic and international market are also not identical. The high-grade padlock in domestic demands are not large, but in developed countries such as Euro-American region are merchants’ favor, so that the foreign trade will order more. Mid-range lock accessories have a hot sales situation, especially the shake hands handle which is full of Arab feature. The lock, because of its suitable style , moderate price, fast delivery etc, foreign trade volume of it is quite big, mainly exported to Japan, South Korea and other Middle East countries. Motorcycle locks and upscale steel wire locks in domestic and international market are sold gradually smooth. The low-standard padlock are mainly exported to Middle East or domestic market (such as Guangzhou, Shanghai, Wenzhou, etc). The products in domestic surrounding areas are main of replenishment. Because of its exquisite and convenient , the low-standard chain lock deeply are welcomed by foreign customers. With the arrival of the tourist hot season, being convenient to carry and suitable for travelling, the combination lock present are popular among foreigners. 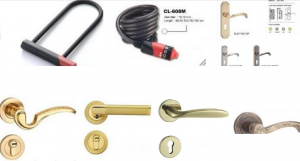 Besides of common locks, the price of the product which has special functions like the magnetic card lock is higher, such as hotel’s computer control locks, fingerprint locks and other products’ sales trend generally. But artistic locks such as individual character of star portrait, cartoon images and so on are sought after by customers. Lock market , a new round of technological competition has started and high-tech trend is clearly, which future of high-end products will develop very well. As China’s high-end residential, automotive, high-grade office buildings and hotels, the rapid development of related industries, high-end locks will continue to increase market demand for such product development has become urgent, such as the IC card electronic door locks, electronic lock , magnetic door locks, fingerprint lock and so on. High-end locks with high technological content, more prominent humane, personalized, and its products are relatively high profit, high-end market prospect is extremely broad. Welcome to Yiwu locks market, we could be your Yiwu agnet!